"Rescuers of the Lost Comic Art"
Ever since the waning days of the nineteenth century when two newspaper magnates vied fot the role of number one, some of America's finest artwork has been arriving on the doorsteps of millions of homes daily. Over the ensuing years when Walt Wallet was rearing Skeezix in Gasoline Alley, when little Nemo explored Slumberland and Barney Google was running Spark Plug at the race track, competing publishing giants William Randolph Hearst and Joseph Pulitzer knew that millions of Americans chose their newspapers, not for the quality of the news, but for their favorite comic strip characters. For the next fifty years, publishers and editors across the country followed suit. Their search for the competitive edge created a uniquely American art form: the comics. It began on January 5, 1896, when a pressman at Pulitzer's New York World experimented with a nonsmudge yellow ink and colored the Yellow Kid's nightgown in Richard Outcault's cartoon drawing of "Hogan's Alley." The Kid's popularity became so sensational that, soon after, Hearst brought Outcault over to his New York Journal. Pulitzer hired him back one more time before Outcault finally ended up with Hearst. In turn, Pulitzer hired George Luks to continue the strip-thus the Yellow Kid appeared in both papers on Sundays. Yellow journalism had begun and so had the comics-an art form comic strip historian Jerry Robinson defines as a continuing cartoon series with a regular cast of characters, a title, a theme and the written word integrated into the drawing. Today, however, under the economic pressures to sacrifice feature space for advertising, the comics are shrinking into obscurity, pushed down by the same dollar-driven industry that spawned them. But tucked away in the Ohio State University library system, curator Lucy Caswell preserves the art's rich history. 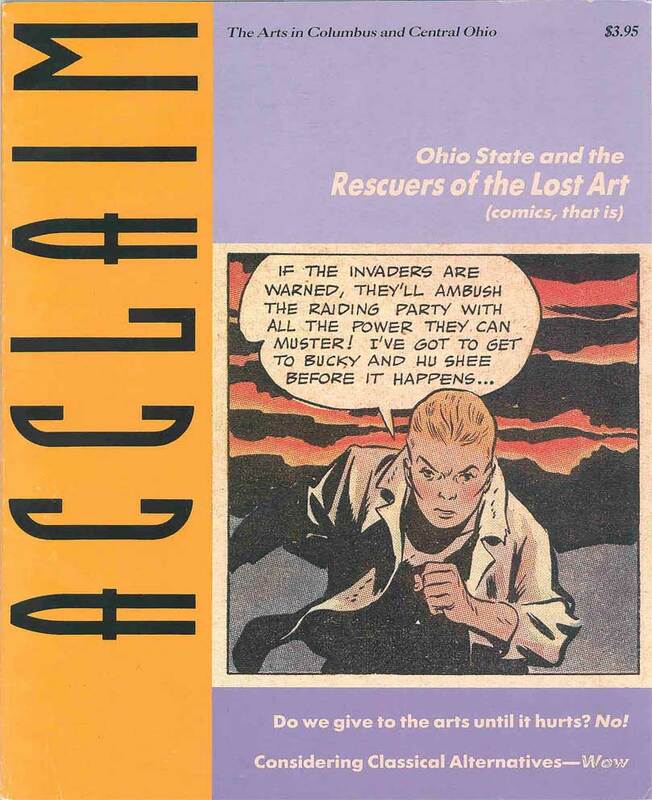 The Ohio State Library for Communication and Graphic Arts, a bastion for academic study of the now-threatened art, houses stacks of portfolio drawers and dozens of file cabinets holding artwork, artist correspondence and other comic strip documentation. Opening the drawers to look at the work of any of the hundreds of artists whose original work Caswell has cataloged convinces the skeptic true artistry has been employed in the comic strips. Archit. ectural detail, nuance of time, inventive gestures and literary genius all combine to make art. They were more than just kid's stuff. In the early days of comics, in strips that composed an entire newspaper page, artists had space to work. One frame could take up half a page. In full color on Sundays Milton Caniff employed in "Terry and the Pirates" some of the most sophisticated techniques of lighting, camera angles and chiaroscuro to tell his often heartwrenching stories of love and war. Winsor McCay challenged his reader's views of reality by manipulating time, space and color in every frame -- save the last -- of "Little Nemo in Slumberland." George Herriman incorporated surreal, almost abstract forms to communicate his simple cat and mouse tales in "Krazy Kat." With lush and elaborate illustration Harold Foster's "Prince Valiant" and Alex Raymond's "Flash Gordon" adventure strips enticed readers into endless journeys through their own imaginations. For fifty years comic strip artists enjoyed ideal conditions. Some, such as Hal Foster, had a background in the arts, studying at the Art Institute of Chicago and the Chicago Academy of Fine Arts. Many came up through the ranks of newspaper illustrators. Each developed a readily identifiable visual and literary style. Two of the most accomplished came from Ohio. Winsor McCay began his career at the Cincinnati Times-Star and Milton Caniff started his at the Columbus Dispatch. But with the advent of television, newspapers lost popularity, advertising dollars got tighter... and the comics started shrinking. As in Nemo's bad dream, the space in which the characters lived and spoke began to implode. Sunday full-page strips became half-sized, then half again. Daily strips that once stretched the width of six columns were cut to three. Prince Valiant, who for years traveled through detailed and colorful lands of castles and primeval forests, today barely has room to mount his horse. At the mercy of the newspaper publishers and editors, comic strip artists fight to maintain the mere thirty-six picas -- six inches -- they are allowed, reduced from forty-four only a few years ago. Only Garry Trudeau, whose "Doonsebury" strip is most commonly found on the editorial page, has managed to retain a forty-four pica provision in his contract. Size alone isn't the problem. If editors believe the comics are less popular, they themselves have created the problem, Caswell says. "(They) have been incredibly stupid," she argues. "There is indeed a declining readership" -- the newspaper editors' standard contention -- "but that is because the comics haven't the room to be nearly as fascinating." At an Ohio State "birthday party" last August for the late Walt Kelly, creator of "Pogo," "Calvin and Hobbes" creator Bill Watterson said it this way: "If Walt Kelly were just starting out today, there would be no 'Pogo' as we know it. Everything that made 'Pogo' one of the greatest comic strips ever drawn is a virtual impossibility in today's newspaper market. 'Pogo' would simply be illegible." Caswell organized the gathering to celebrate the library's receipt of Selby Kelly's gift of her late husband's files and original artwork. Such events, along with the triennial library-sponsored Festival of Cartoon Art, attract dozens of comic strip artists and appreciators to Columbus -- Watterson among them. Despite the restrictions he speaks of, Watterson has risen to the top of his profession. In the traditions of the master comic strip artists, his strip makes full use of the combination of visual and literary opportunities inherent in his medium. By jumping back and forth from young Calvin's daily reality-drawn in cartoon style to a more realistically depicted fantasy world, Watterson asks the reader to reexamine which is more real: Is Hobbes the stuffed toy tiger the world can see or is he the very real, alive and often irritating companion that motivates Calvin to action? "I've been extremely pleased to see the (Ohio State library's) professional and scholarly approach to the work they own and their serious treatment of cartoon art," Watterson says in a telephone interview from his home in Hudson, Ohio. "Cartoons aren't regarded as serious art and this is a first step (toward turning that around)." On the other hand, he hopes the library and the festivals it produces aren't just a product of "collector mentality" -- inspired by the notion that original comic strip artwork is becoming more valuable simply because it's rare. Caswell also recognizes the importance of building trust and reputation. The library's purpose, she explains, is to to acquire, organize and preserve cartoon art in order to make it available for research. Caswell helped establish the library in 1974, a year after Milton Caniff donated his papers to the university. Hundreds of flles contain everything from fan letters to World War II research material for Caniffs "Male Call." Caswell is still sorting, using her library science expertise to organize the material in a way most accessible to researchers with a potentially wide variety of purposes. But early on she recognized that the library could not be limited to one man's work. A strong center for academic study must have many such collections. Much of her job therefore is to establish the library's reputation and gain enough trust to entice people to donate their materials. One way she does that is with the serious treatment given to the festivals. Each accompanies a cartoon art exhibition and catalog. Three festival days include lectures and panel discussions on such topics as "Creative Freedom and the Cartoons" and "The Future of Cartoon Art in the Newspaper." "Chalk taiks" feature such artists as "Wee Pals'" Morrie Turner and "Adam's" Brian Bassett sharing their drawing process and techniques. The next festival is planned for October of this year. The Ohio State festival is one of three conferences comic strip artists might regularly attend, explains Michael Astor, who writes for Editor and Publisher, a trade magazine. But cartoon art is only a segment of the Newspaper Features Council conference and dissemination of awards is the primary focus of the one sponsored by the National Cartoon Society. Of the three, he says that at the Ohio festival he "got the most information about cartooning (concentrated) in one place." While the library plays an indubitable role in preserving the art's history, it could also influence its future by helping educate what Watterson refers to as an audience "enthusiastic but not necessarily finely attuned to the nuances ofthe aesthetic. "Few comic strip readers today even remember when the frames were printed larger," he says. He has just spent almost three hours working out the four frames of a daily strip that will run in a month's time. With that perspective, the constraints he discusses seem all the more concrete. "It just boggles my mind that no one (in the newspaper publishing business) will do anything to treat the work with any dignity," he says. The Cincinnati Post, for instance, reduces Watterson's original work with an ECRM digital scanner that is able to fit the strip into the Post's allotted space by squeezing the height more than the width. Thus Calvin and his tiger Hobbes look a little squatter to Cincinnatians. "That's a real violation of the work," Watterson says. "It's very discouraging. "You just can't do it in a space one inch high by six inches wide: There's no room to tell a decent story. And that's really contributed to the decline of intelligence in the art." The lack of respect given to the strips comes partly from the general perception that they are children's entertainment. "We've got to educate people into realizing, yes, there are crummy strips with six-year-old mentalities. But there are also some by thinking adults intended to be read by adults. They are more than just a joke." What differentiates the finer strip from the rest is "an issue -- not necessarily political -- but one talking about real things in real life." As for the humor, that's a "minimum daily requirement," an element that helps the strip deliver its point. Another of Watterson's concerns is that of ownership, and the practice of newspaper syndicates to treat a strip as a commodity that any artist can reproduce. "I'm not in favor of any strip living past the life or retirement of its creator," he says. "The syndicates are saying anyone can do (a particular strip). But if it can survive, it shows it wasn't good to begin with. A good strip should be as idiosyncratic as the person who creates it. It's like saying if Picasso died, someone else could keep pumping out Picassos. If the artist is doing his job, he's presenting a world as unique as the artist himself." Watterson believes a great comic strip requires three elements: a talented creator, someone willing to publish the work and a way of presenting it that will show off its integrity. Will those conditions ever happen again in the daily or even weekly newspaper format? "It can come to pass," he says, "but I'm not optimistic." Instead he predicts that the talent is getting "frustrated with the limitations and eventually something's got to give." Caswell suggests the comic strip artist's future might lie in the graphic novel, which, she notes, are not necessarily funny. Nor are the comics anymore, for that matter. In countries where they've become popular they also have more appropriate names: The French bande dessinee means "strip of pictures" and the Italian fumetti means "smoke cloud," perhaps referring to the dialogue balloon. The fact that in English there is no similarly appropriate name is an indication to Caswell "of what our culture has not done in terms of taking the art seriously." In this country the "graphic novel" form has been successfully adopted by "The Spirit" creator Will Eisner, who has pubIished a series of them. Perhaps the most successful has been Art Spiegelman's "Maus: A Survivor's Tale," the story of the Holocaust as told with mice as Polish Jews and cats as German soldiers. Caswell recalls Spiegelman's visit to Columbus and the response of those who met him. "Each person had a story," she recalls, "and they wanted to share their story with him." A lecture at the Yassenoff Jewish Center ended with a woman weeping, telling of her own experiences as a child. Another related that at one point in Spiegelman's book, the pictures and story were so powerful and so intense she couldn't continue reading. "That kind of personal witness about the book should say to people, wait a minute, there's something really serious possible with this medium." But however moving, graphic novels lack one of the powerful comic strip elements: short daily installments that captivate the reader over a long-term basis, establishing a unique rapport between the art and the audience. "You'd miss the dailiness where you get one little unpretentious accessible thing each day and it comes right to your door," Watterson adds. Another option for the future is the comic strip newspaper that publishes only comics. Columbus' Hoot is one of less than a dozen such publications in this country. It is free to the public, pays its expenses through advertising sales and, publisher Irv Oslin explains, for the strips it runs, creates an audience in the Midwest where otherwise one wouldn't exist. Published biweekly it features twelve installments -- two cycles of Monday through Saturday -- of "Zippy the Pinhead" and strips and panels of other comics that rarely appear in the conventional papers. More likely than not, because of their content and form, they never will. Still, for some of its artists, Hoot functions as a stepping stone to bigger markets. Oslin claims, for instance, that "Bizarro" would never have made it into the Columbus Dispatch if it hadn't run in Hoot first. Lee Salem, Watterson's editor at Universal Press Syndicate, considers the significance of such papers. "They serve a really ardent fan," he says, "but I don't know if the readership is wide enough to have an impact. In terms of economics, they couldn't pay. What the (Columbus) Dispatch pays for a strip." Hoot currently distributes to fifteen thousand readers, including 150 paid subscribers with ten new subscriptions coming in every two weeks, according to Oslin's estimates. Another option is to beef up the comic page as Owen McCarren has done in his weekly "Cavalcade of Comics" for The Chronicle-Herald and The Mail-Star in Halifax, Nova Scotia. Full-page birthday "celebrations" of the various strips attract enough advertisers to fill fifty percent of the publication's fifteen pages. But even McCarran doesn't see much hope for bringing back the old-style comics. "It's too expensive," he says. "You've got to get as much out of the space as possible." Perhaps the newspaper comics' only chance for a healthy future lies in the vocal support and demands from the readers who could collectively make a significant difference. Salem explains, for instance, that the most recent size reduction was promulgated by the American Newspaper Publishers Association to facilitate advertising. No artists were consulted. "Nothing prevents it (from happening again). All we can hope for is that enough concern is raised that such a move is resisted." Watterson believes the comics will continue to deteriorate "until the audience says, We're not going to stand for this. Essentially they need to say (to the newspaper editors), You think editorial content is important-you don't reduce the size of the type of 'Dear Abby,' but you do it to comics. The comic page is important and that's the reason we buy the newspaper." But even for Watterson, an understanding of his art's potential didn't come all at once. "As I've done 'Calvin and Hobbes,' I've realized the abuses on the newspaper and syndicate end. But I'm also gradually realizing what the medium is capable of. The potential isn't being realized. My contention is that nobody's ever seen what cartoons are capable of being." As Lucy Caswell does her job and readers recognize the value of the comics, they will become, as Watterson suggests, more vocal and demand strips that are "wellwritten and intelligent." Maybe then editors will "print it seriously and give it a size where it can do what it's supposed to." Interesting stuff, indeed. Though largely, at this point, from a historical perspective I think. Strange to think that was only 20 years ago, because so much of the discussion seems like a debate over deck-chair arrangements on the Titanic, at least considered in today's context. That dang ol' internet thing, sure has changed things.